The T.I.G.E.R.S. 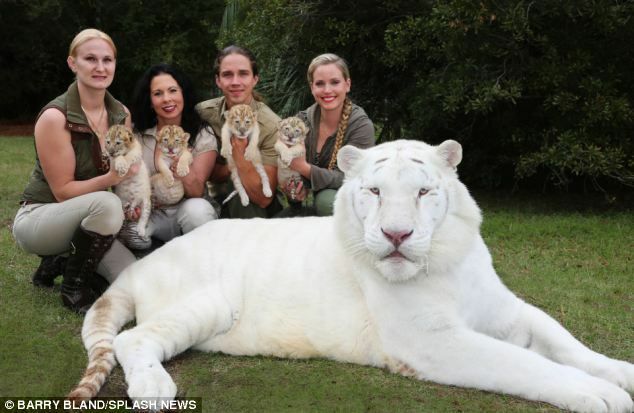 Sanctuary in Myrtle Beach, South Carolina, is home to four of the rarest cats in the world: white ligers. 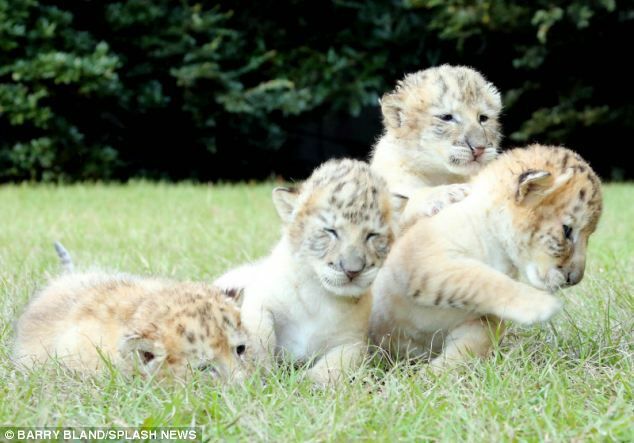 Four white liger cubs were born at the Institute of Greatly Endangered and Rare Species to their parents, a white tiger named Ivory and a white lion named Saraswati. The cubs are the first to be born from this parental combination, making them some of the most unusual big cats in existence. Ligers are rare and not typically seen outside of captivity. 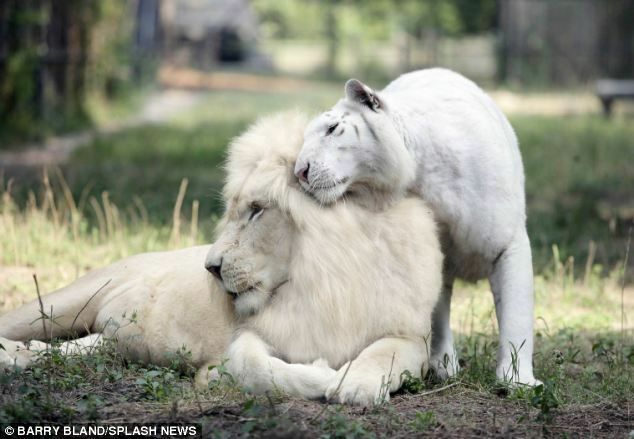 The white liger is itself drawn from two endangered species; only 1,200 white tigers and 300 white lions exist in the world. 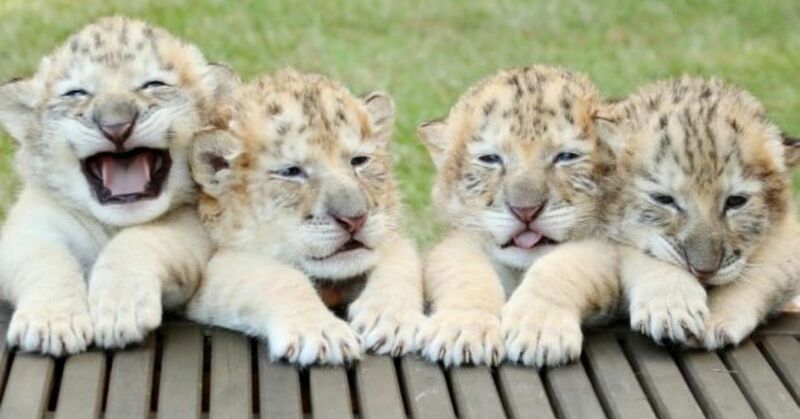 Although 1,000 ligers live in captivity worldwide, these four male cubs are the only white ones. Ligers are known to grow to substantial heights and weights, and these cubs are already living up to their breed's standard. The cubs weighed 15 pounds at six weeks of age and gaining roughly a pound a day. The four cubs have been named Odlin, Yeti, Apollo and Sampson, and despite how quickly they are growing, they exhibit typical cat behavior. The cubs can be found wrestling and running around in the grass at the sanctuary and getting into the general types of mischief cubs are known for. 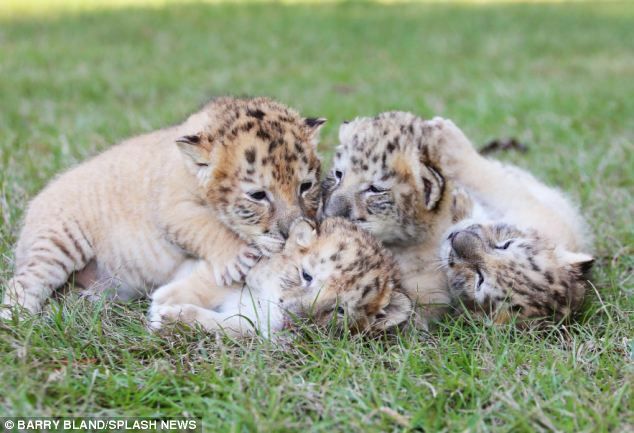 These four brothers excel at posing for photos and playing rough-and-tumble with each other every day. They are utterly adorable, and their pictures prove it. Apollo, the smallest of the cubs, is known for acting more like a domesticated kitten, always purring and wanting to be petted. The biggest and loudest of the cubs is Yeti, who seems destined to follow in the rather large footsteps of his uncle, Hercules. The cubs' uncle holds the Guinness World Record for world's largest cat at 131 inches long and 922 pounds. Dr. Bhagavan Antle, who oversaw the breeding process, believes Yeti will grow large enough to challenge his uncle's record. "I am convinced Yeti will make the Guinness Book of Records. He’s so big already — he has such a big, fat head and paws. All the cubs grow so quickly, but Yeti is already so much bigger. I skip a day seeing them and it looks like they’ve doubled in size. It’s like someone’s blowing them up with a tyre pump," Antle said. The cubs should grow to at least 10 feet tall and 900 pounds by the time they are 4 years old. The T.I.G.E.R.S. 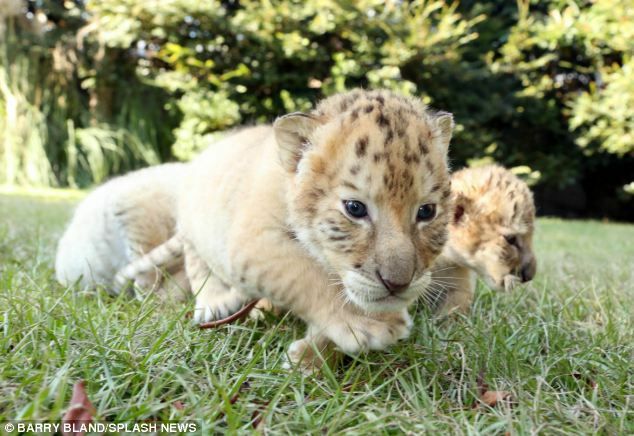 Sanctuary has successfully bred ligers before, so these cubs have a happy and healthy future. Check out the video below for more pictures and information about these unique and amazing ligers.